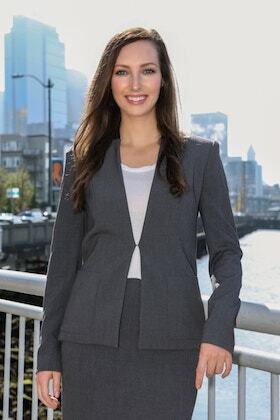 Attorney Marissa A. Olsson practices exclusively personal injury, representing individuals who have been injured due to someone else’s negligence. She is an active litigator licensed to practice in all Washington State Courts, the United States Court of Appeals for the Ninth Circuit, and the United States District Court for the Western District of Washington. Marissa’s practice focuses primarily on maritime injury claims, catastrophic injury claims, and wrongful death. Marissa obtained her JD from the University of Washington School of Law. While in Law School, Marissa was involved in multiple clinical studies programs. As a member of the Innocence Project Northwest clinic she represented incarcerated individuals with claims of actual innocence. Through the Street Law clinic she taught basic law courses at Roosevelt High School in Seattle. She also interned at Northwest Justice Project, providing free legal aid to low-income clients. During law school, she was an award-winning competitor in moot court competitions. From 2008-2009 she served as a research assistant to UW School of Law Professor Kathryn Watts, and assisted with the articles Proposing a Place for Politics in Arbitrary and Capricious Review, 119 YLJ 2 (2009) and From Chevron to Massachusetts: Justice Stevens's Approach to Securing the Public Interest, 43 U.C. Davis L. Rev. 1021 (2010).